The Virals are put to the ultimate test when they find a geocache containing an ornate puzzle box. Shelton decodes the cipher inside, only to find more tantalizing clues left by "The Gamemaster." A second, greater geocache is within reach—if the Virals are up to the challenge. But the hunt takes a dark turn when Tory locates the other box—a fake bomb, along with a sinister proposal from The Gamemaster. Now, the real game has begun: another bomb is out there—a real one—and the clock is ticking. Woo Hoo! 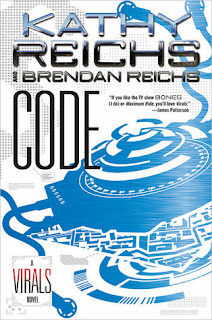 Ever since I discovered the Virals series by Kathy Reichs and her son Brendan, I was hooked!! The series revolves around a group of kids who live on an island used for a scientific research facility. The only people that live on the island are employees of the facility and their families, so these kids have a unique lifestyle that unites them. Tory, Hi, Shelton and Ben are your typical teenage kids who don't fit in at their local prep school. They get picked on because they are the weird science kids that live on an island. But the best friends have a secret. Their DNA is infused with wolf DNA and they have special abilities. They are viral! I think it would be awesome to have wolf senses and be connected to my friends through crazy pack genetics. This latest installment finds the Virals searching out a geocache in what they think is a game that Hi has dragged them all into. He is so excited, because it is the first geocache placed on Loggerhead Island. Inside the geocache is a puzzle box. When they finally get the box open, they find another clue, which is against the rules. The hunt spirals out of control as the Virals realize that the "Gamemaster" is really a psycho who is planning on killing lots of people if they don't successfully play his game, on his timeframe, according to his rules. Throw in the fact that Tory's life is being taken over by her dad's overly peppy and pushy girlfriend and it makes for an interesting story. This third book was even better than the 2 before it. 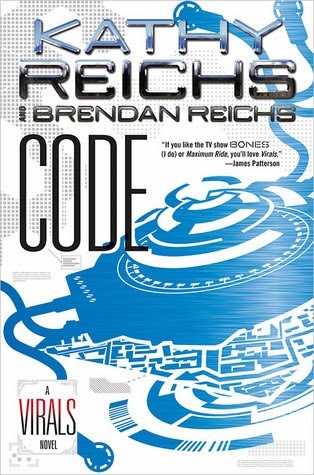 I wondered how Reichs would be able to keep the story going forward and be different, since the first 2 had many similar elements, but this one blew the first 2 away. I tend to not like YA books sometimes, because they can be too safe and "dumbed down", and I think we don't give YA readers enough credit. But, Kathy Reichs doesn't leave the danger or pain out of these books. I'm excited to see where she takes the series next and how the Virals are going to develop individually and as a pack.